We are sorry. Amazon has encountered an error. Please try again. It looks like WhatsApp is not installed on your phone. Please use a different way to share. Unlike tablets, Kindle Paperwhite is designed to deliver the best reading experience, period. 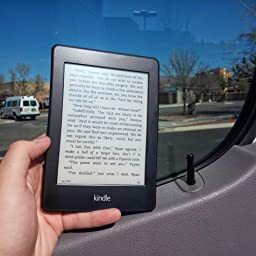 Kindle Paperwhite has no screen glare in bright sunlight, a battery that lasts weeks, not hours, and a built-in light that allows you to read without eyestrain. Screen Size 6" 6" 6"
Dimensions 6.7" x 4.7" x 0.40" 6.7" x 4.6" x 0.36" 6.4" x 4.5" x 0.30"
Error posting question. Please try again. Don't see the answer you're looking for? Sorry, we were unable to perform your search at this time. Submit your question to our community by clicking the 'Ask' button. Don't see the answer you're looking for? Ask Don't see the answer you're looking for? Sorry, we were unable to perform your search at this time. Submit your question to our community by clicking the 'Ask' button. There was a problem completing your request. Please try again later. Q: can you read in the dark? Q: Is it possible to highlight sentences or words? Q: Will this Kindle read to me? A: No, it will not. A new step forward for me in reading on my Kindle! I have loved and used my Kindle Keyboard for years now but I missed not being able to read it in a room with low lighting or in the dark. I purchased a Kindle Fire and I also use an iPad 3 but for ease of reading on my eyes I prefer the Kindle Keyboard. I wanted to get a Kindle Paperwhite e-Reader but I held off until this new generation was released before I spent my money. I got this because I wanted to reduce my eyestrain from reading in the evening and I just love this new tablet. It offers the perfect balance of a lit screen with reduced eyestrain and high clarity and contrast of the text. 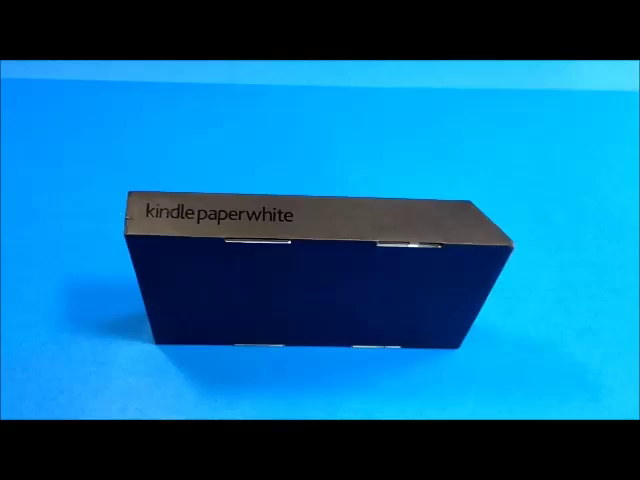 I have added a video of the Kindle Paperwhite compared to a Kindle Keyboard and a Kindle Fire. If you have any questions please feel free to contact me and I will try to answer them. I love that the text on the screen is crisp and clear. I use the Kindle because my declining vision caused me to stop reading books. Reading was my number one hobby my entire life and I just loved it. The Kindle has brought back that reading experience and now with the crisper text and lit screen I can enjoy my reading in every type of environment. I laid my Kindle Keyboard and the New Kindle Paperwhite side by side and the comparison of the quality of text and clarity is amazingly in favor of the new Paperwhite. The new lighting system and screen clarity is where this Paperwhite design really is outstanding. 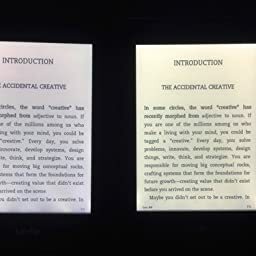 With better contrast, lighting and custom designed fonts, the text just pops out of the screen like you have not seen in an e-Reader before. With 221 PPI (Pixels Per Inch) this screen provides a 768 by 1024 pixel screen that just makes the old Kindle Keyboard look old fashioned. Technology certainly does move quickly on. My favorite time to read is the last two hours of the evening before bedtime. Unfortunately that is the worst time to use a non-lit screen e-Reader. I went to using the Kindle Fire and the iPad 3. Unfortunately I noticed eyestrain that limited my reading time and I did not get the full enjoyment of spending my time reading. This new soft lit screen is unobtrusive and for me my eyes do not get tired of reading like they do on the Kindle Fire and on the iPad. After reading on the other backlit tablets I feel like I have that 1000 yard stare with dry and tired eyes. This lighting effect is softer and easier to read without the tired eyes and blurry vision. 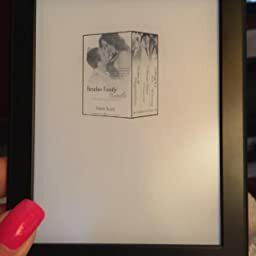 I am glad that I finally made the investment to get an updated Kindle Paperwhite. 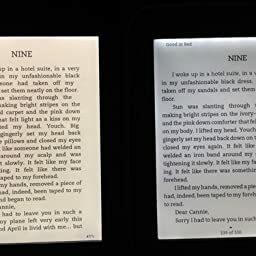 There are 8 font sizes and I recently learned from one of the brilliant people who added a comment to this review that you can pinch and zoom on the Kindle Paperwhite to expand the font size or decrease it like you do on a powerful tablet, this is a great feature. There are 6 different font styles and they are Baskerville, Futura, Caecilia, Helvetica, Caecilia Condensed and Palatino. The fonts have been fine tuned to offer additional sharpness and clarity which is great for reducing eyestrain and fatigue. I love the new dictionary feature that creates a Vocabulary Builder which is a list of the words that you looked up and you can review the list and use flashcards to enhance your vocabulary and reading skills. I thought that I would have trouble making the transition from the Kindle Keyboard to the New Kindle Paperwhite but it was a breeze. 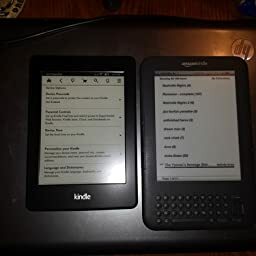 I think that using a touch screen and using finger swipes to turn pages and emulated keyboards like on the Kindle Fire and iPad made it a natural transition to this new Kindle. There is a minor learning curve of learning where to touch the screen but the changeover was fast and easy. The capacitive touch response of the screen is very nice. It makes the New Paperwhite respond quickly to finger touches, menu changes and page turns and the faster CPU helps there also. 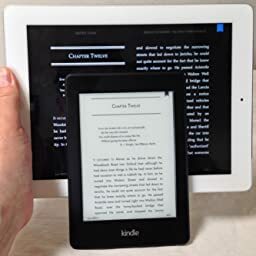 What I like about the Kindle Paperwhite is that it is a dedicated e-Reader and it combines the best features of the Kindle e-ink and the iPad/Kindle Fire. * Ultra lightweight at 7.3 ounces and easily held for hours with one hand. I love the size and weight as it is comfortable to hold for long periods of time and you don't find yourself laying down the Paperwhite like I would be doing with my iPad 3. * Lit screen for reading in poorly lighted areas like the iPad and Kindle Fire but without the eyestrain. The lighting level is adjustable. * Ability to be easily read in the sunlight with no screen glare. * Battery life of 28 hours (of reading time) depending on the WIFI usage and screen brightness used. * Easy page turning and access to the onboard dictionary, access to Wikipedia and X-Ray. * 25% faster response for loading books and page turning thanks to a faster microprocessor. * My favorite feature is the adjustable text size and font style! * Since I review a lot of books I love to highlight sections and text as well as take notes on the screen. * Web surfing is possible but still slower than a good tablet. Who cares, this is my portable ebook reader with 1,100 books in it. I have other devices to browse the web and read my email. * I like the rubberized feel of the back and it is similar to my Kindle Fire. It makes the Kindle Paperwhite easy to grip and hold with one hand and just have it lay in the palm of my hand without a case. This tablet gives me the best reading conditions in the daytime and also in the night. 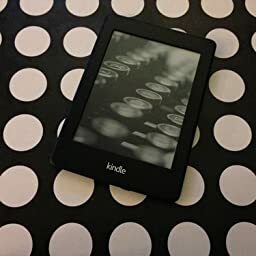 It has a lot of great features but I wanted to post a review that provides a strong comparison between the new Kindle Paperwhite, the Kindle Keyboard and the Kindle Fire when used as purely a reading device. * No distractions from phone calls. * You can use a capacitive stylus on the screen to help keep the screen clean. * Great battery life and fast charging. * Perfect form factor for size and weight for a hand held portable e-reader. * I don't need to use the stupid book light that never worked well anyway! * Faster page tuning which for me really makes a difference. * Connection to the WIFI was fast and easy. * Downloading my book library was fast and easy. * It still costs extra money for an AC wall adapter. It comes with a USB to Micro USB cable that you can use for charging and connecting to any AC USB wall adapter or computer USB port. I don't need another USB power adapter but not getting one just makes Amazon look cheap in not supplying one with the product. * No speakers and no ability to have the book read aloud to you using text to speech. * Dropping the memory to 2 GIG with only 1.25 GIG available. I know 1100 book storage is a lot but memory is getting cheaper and not more expensive. I already own 703 Kindle books and I continually purchase more. I would just have preferred more memory. Overall considering all the issues this is a great e-Reader. It is the best available at this time. I do feel that Amazon always gives some things and takes away others. Things like memory/book storage capacity, text to speech, speakers and AC wall chargers disappear from new products and sometimes return in others. I also don't care for the ads still being pushed in our faces. This is still a solid 5 star product and you can't go wrong with buying one. It is just that sometimes the things you lose seem to mean more to users than to Amazon. I don't mind them saving some money but raise the price $10 and put in all the features that users will need like a charger. This product with a few other features left in could have be a 10 star item with no regrets! I had a kindle keyboard. I still have. I'm not sure I'm ready to part with it. I'm rather attached. The kindle is *the* e-reader. It's fantastic. I had my kindle keyboard for a couple years and I couldn't imagine reading on anything else. There were times I left my kindle at work and had to read on my ipad. I hated it. However I found the keyboard interface to be cumbersome and just "old". I wanted something new. So onto the paperwhite. Mine was a gift. I have the wifi only version. Why would you need the 3G? Just download several books at once and you are good to go. I will say that the paperwhite light is fantastic. Have you watched the videos on the paperwhite. It's not a "traditional" backlight. It does not shine the light towards your eyes, but rather down at the screen. GENIUS!!!! I sit at a computer all day. I do not want more light shining at my eyes. Which is why I loved my kindle keyboard for so long. I haven't had the paperwhite very long, but I keep it at about a medium brightness so far. I love that I can now read in bed with no other light. The paperwhite is light weight. It's rather small, but about the same width as the kindle keyboard. I put both kindles on the same page of a book and more lines were rendered on the paperwhite than the keyboard. But the font isn't smaller. Somehow more words are fit on the page. I like the touchscreen interface. I really found the keyboard keys to be tedious. I kind of sort of miss the page flip buttons though. I loved those. Since they were on both sides of the kindle, they were easily accessible no matter what I was doing at the time or how I was laying. IMO the jury is still out on whether or not I can live without those buttons. So far I'm doing ok, but I will confess to missing them greatly. I also preferred the sliding power button on the kindle keyboard rather than the push one on the paperwhite. But overall the paperwhite is fanastic. It's a huge upgrade and I'm thrilled with it!!! If you still have the kindle keyboard don't think twice about upgrading. You will love the paperwhite. I really really miss the page keys. I find myself turning pages that I don't mean to. And I'd *really* want to be able to turn the page with my left hand when necessary without reaching across the kindle to tap the right side of the screen. The battery doesn't last 8 week. What the heck? No way. I also confirmed that I really like the sliding power switch. I mentioned that in the initial review but after using it for a few weeks I realize how much I miss the sliding power switch. I could turn my old kindle off with one hand. I haven't quite mastered that with this kindle since I have to push the button. Maybe once the case (which was really backordered) arrives that will help, but I can't grip the kindle well enough with one hand to push the button as well with that same hand. I still love this kindle. Reading in poor lighting is so much better, but I wish some things had carried over. This review is for the second generation Kindle Paperwhite. Like all kindle e-readers before it, this is a great product. However, I am a bit disappointed as there is not a huge improvement over last year's model. For this review, I focused on features and enhancements exclusive to the new Paperwhite and tried to make comparisons to last year's model. Also, I found somethings misrepresented or confusing in the advertising, so I will try to clear them up. Design - The Kindle white has a nice look and shape. It fits well and is easy to hold in one hand. It's fairly light, so it doesn't tire the hands too much. I can grip it for long periods before having to switching hands. Its design is very similar to the previous Paperwhite - almost identical. The height and width are the same, the buttons are in the same location, and although this version is slightly lighter, it is not noticeable. Display - Although not a huge improvement from last year's model, the display is one of the best features of the Paperwhite. Like most e-readers, the Paperwhite uses digital ink technology. This model employs a more advanced version. In addition, the lighting has been upgraded, so among other things, it is more evenly lit. Together, they make for incredible viewing. In my opinion, it's one of the best digital ink e-reader display on the market. I really enjoy reading on it, text look very sharp and crisp, with little to no eye strain. Processor - The Paperwhite has an upgraded processor, which means smoother page turns and navigation. I am able to open books, flip pages, and navigate menus fairly quickly. There is barely any lag as I flip through many pages at a time. Also, the flashing effect when turning pages shows up less if at all. Although, when turning to a new page, I can still see remnants in the empty spaces caused by the text from the previous page, but not sure how much of this is because of processor speed. This is a nice upgrade from the previous Paperwhite. Touchscreen - The touchscreen is good, it works as it should. The screen responds to the items I am trying to select. Rarely does it misinterpret my selection. Battery Life - I haven't really had a chance to test this out, but Amazon quotes battery life to be eight weeks. Note, these are under very specific conditions - "based on a half hour of reading per day with wireless off and the light setting at 10." So let's do the math, 8 weeks x 7 days in a week = 56 days * .5 hours/day = 28 hour battery life. This is with wireless off and light at 10. Turn on wireless or raise the light setting, and performance drops. So battery life is not as huge of a jump from other devices as Amazon would lead us to believe. In addition to hardware, the Paperwhite has some software upgrades. Initially they seem like separate and unique improvements. However, I found much of it to revolve around a single enhancement with many features added to it. That enhancement is the picture-in-picture screen. With this popup like screen, you are able to see information and navigate menus without leaving the current page you are reading. The device has leveraged the popup in several ways. Word Lookup - One of the things I love about e-readers over traditional books is the ability to look up definitions of words in real-time, right from the device. No need to pull out a separate dictionary or thesaurus. Although most e-readers have this feature, I like the enhancement made for the new Paperwhite. It allows me to lookup a word on dictionary, x-ray, and Wikipedia on a single interface. For me this is great. I am a knowledge seeker, and when I come across something I want to know more about, whether it is a definition of a word or getting background information about a term, I can do that. Page Flip - The page flip function is probably the best improvement of the upgraded software, it rocks! With it, I can skim forward or backward, like flipping back and forth between the pages of a real book. It's not quite like a real book, but in some respects a little better. It works by opening a popup window on top of the current page I am on. From this popup screen, I can scroll back and forth by page or by chapter. Since I am skimming on the popup screen, I never lose my place. I find it really handy for referencing a chart or visual aid on another page, or if I want go back to review or reread a section I didn't fully understand. When I am done, I can close out of the popup window to go back to the original page. Foot Note - Nothing huge, but worth noting. In previous kindle versions, looking at a footnote meant navigating away from the page you are reading. With the addition of the popup function, footnotes instead open up in a separate screen. Not a huge enhancement, unless you are reading footnote heavy books, but then again how many of us really are? Vocabulary Builder - Not something useful to me, but others might enjoy. The Paperwhite will collect all the words you look up definitions for and archive them so you can view them later. This can be used as a way to build your vocabulary. It has built in support to review the words like a flashcard, which will display both the definition of the word and its context. Again, not something for me, but I can see it being useful for the geek at heart. Free Time - Don't have kids so can't give an elaborate opinion on this. All I know is that it is a parental control feature similar to what is on the Kindle Fire HD. It puts restrictions on what your kids can do and see when using the device. Goodreads - For those who don't know, Goodreads is essentially a social network for readers, where people can review books and exchange recommendations. Amazon recently purchased Goodreads, allowing the company to now also become a social networking service. It will be interesting how Amazon moves forward with this, or what will happen now that Goodreads is no longer independent. Currently, the Paperwhite comes in two versions, WiFi Only and 3G. Wifi Only - The wifi version costs $119. Wifi doesn't mean you can browse the web on it. It simply means you can purchase and download books without connecting it to a computer. 3G - This version cost $189. It isn't like buying a 3G Tablet, where you will have to pay for a monthly data plan. Again, you can't use it to surf the internet. The benefit of 3G on this device is that it allows you to purchase books independent of a wifi connection, but you need to be in an area with 3G cellular coverage. So if you're on the actual Amazon, Amazon.com can't deliver to you. This version is not slated to be released until early November. Ads - Ads are shown on the home screen on both versions when the screen goes to sleep or you power the device on. For an additional $20, you can opt out of the ads. I was pretty vocal with my dislike of ads in my review of the Kindle Fire HD last year. I think ads are tasteless and cheapen the experience, and don't belong here. But like for any corporation, money is king. When you buy an e-reader, you are not just getting a physical product, you are getting amenities of that brand's ecosystem. For example, if you buy a Barnes and Noble Nook, you can read books for free in their stores. If you buy a kindle, you get features like X-ray, which as I said I really like. Personally, I think Amazon has one of the better eco-systems for books. They have a library not available anywhere else, if you are a Prime member, you can download books for free, and now with the acquisition of Goodreads, they have really changed the game. I mentioned last year in the Fire HD review that Amazon has always been at the forefront of the book buying and reading experience. I still feel that way. I think they are always innovating in this area. Some of the innovations aren't the best, but I give them credit for trying. If we ever fall into a police state society where books are banned, like in Ray Bradbury's novel Farenhiet 451, something tells me Amazon will be the revolutionary force using some advanced form of whispersycn technology to make sure books still reach people...probably not, but it gives you an idea of how dedicated they are to books. If you own last year's Paperwhite - I don't think it is worth the upgrade. I don't really see this as a second generation Paperwhite device. In terms of design and hardware, it is nearly unchanged. Yes pages turn faster, but your reading experience is not going to change that much. The useful enhancements are in the software, but if you are interested in those, Amazon will likely have updates available for the older kindles. A true upgrade would have been to add a stylus so you can take and save handwritten notes or maybe offer a model with a bigger screen. If you do trade up though, one benefit is that your old cases will still fit. If you own a Kindle Fire, Fire HD, or another Tablet - and are thinking about getting a more portable reader, I recommend it. I personally like reading more on an e-reader than a tablet. In sunlight, there is significantly less glare, and since you don't have a bright screen shining in your face, reading doesn't feel as intense. Also, e-readers are smaller and lighter so it is easier to carry them with me to the park or beach. Another benefit is that battery life on e-readers are considerably longer, not eight weeks as Amazon has listed, but enough so I am not charging it daily. If you own another kindle model - I believe it is worth the upgrade. You'll get a bigger, better, and brighter screen, a faster device, touch screen, and more features in terms of software. If you don't own any e-readers and this will be your first purchase, or if you're just waking out of a coma and the concept of e-readers is new, you can't go wrong with the new Paperwhite. Good combination of hardware, software, and ecosystem. Hope this review has been helpful and given you useful information for your decision. One thing I didn't include is a comparison to other brands. Personally, and I hate to say this, but I don't see a future for many of them. What Apple did to Virgin Music and other record stores, Amazon is on the verge of doing to bookstores and retailers. I've used many Kindle's over the years, starting with the original one which I still have and still works to this day. 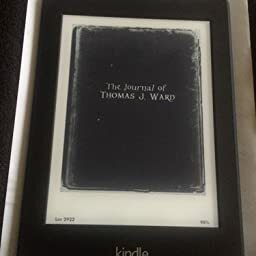 The Kindle PaperWhite addressed many of the issues I had with previous Kindle models and generations and this new 2nd generation PaperWhite brings some small but noticeable improvements over the 1st generation. The Kindle PaperWhite comes with a nice 212 ppi screen which is noticeably crisper and bolder than the standard, entry level Kindles, yet still slightly lower than the Kindle Voyage which boasts an impressive 300 ppi resolution. While it's nearly impossible for the human eye to see individual pixels at 300 ppi, 212 ppi isn't that far behind. UPDATE: The new screen boasts an impressive 25% increase in contrast (the manufacturer, E-Ink, claims it's actually a 50% increase) and a 22% better reflection prevention. This new display is called "E-Ink Carta" and replaces the 1st generation PaperWhite's "E-Ink Pearl" display. Faster page turns are also achieved by the new display due to the way the screen handles changing the "e-ink" between pages. Comparing my 1st gen and 2nd gen side-by-side, I didn't notice a huge improvement in contrast or "ink" saturation, however, when comparing my 1st gen to my brother's 2nd gen, the difference was very noticeable. So, either I got stuck with a dud, or I just need to tweak some settings on mine. The screen is a touchscreen and is very responsive and accurate; something that is sometimes a problem with touchscreen eReaders that are either unresponsive or inaccurate, forcing the user to press harder or very precisely touch areas of the screen to get a response. 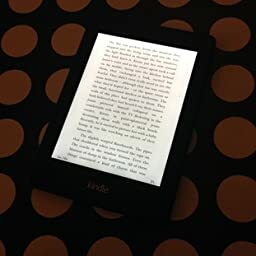 One of the biggest complaints of the 1st generation PaperWhite was the backlight, mainly due to the noticeable shadows seen at the bottom of the screen, especially when used in dark rooms or at night. Although I personally felt the shadows were not that big of a deal and most of time I never even noticed them, because so many people complained, Amazon went ahead and fixed it so this is probably the most noticeable upgrade from the previous generation. The backlight can be adjusted, as needed, which is nice as having it at a high-brightness level at night is actually hard on the eyes and for some people, makes it difficult to use for long periods of time. The opposite is true in bright light situations where the backlight being turned up higher actually helps make it easier to read. Amazon claims the Kindle PaperWhite can go weeks (up to 8 weeks mentioned on some websites out there) but in real use case scenarios, the battery life is nowhere near that level. While the PaperWhite does have decent battery life, it is more likely to be in the one to two week range, not four weeks and certainly not eight weeks, especially if you're using WiFi at all to download new books, or to get your daily reads delivered such as newspapers and blogs. The PaperWhite charges very quickly so you shouldn't have any worries about topping off the battery as needed. The battery life is perfectly acceptable and adequate and you should have no problems even on week or two long vacation, for example, especially when compared to alternatives like a tablet, Chromebook, smartphone, etc. The new PaperWhite is the same size as the last generation which is nice because it allows you to reuse your current case. While I'm sure this has irritated the case manufacturers, it certainly is a nice thing for us! Even better, although the PaperWhite retains its size, it does take a slight trim in the weight, coming in at 7.3 ounces, compared to last generation's 7.8 ounces... again, not really noticeable, but a small improvement nonetheless. Regarding cases, I would strongly recommend getting one of the magnetic cases because they automatically turn the PaperWhite on and off simply by opening or closing the cover. It's a simple AutoWake feature but it does come in handy as you don't have to mess around trying to find the tiny on/off switch every time you put your PaperWhite away or take a break from reading. I'm not sure which case I have but I think it's the Amazon brand case and it works really well. I do know I bought them at the same time as they had a bundle sale at the local electronics store I purchased them from. This new generation PaperWhite is noticeably peppier and much more responsive than the first generation, mainly due to the new "E-Ink Carta" screen which has replaced the older "E-Ink Pearl" display. While the first generation wasn't slow by any means, it is nicer to have the faster response time as it helps avoid tapping the screen twice to turn the page, only to find out you've skipped a page and have to go back! On board storage is 4GB (increased from 2GB just recently) which will handle a library of thousands of books, not to mention you have free, unlimited cloud-based storage for your content. 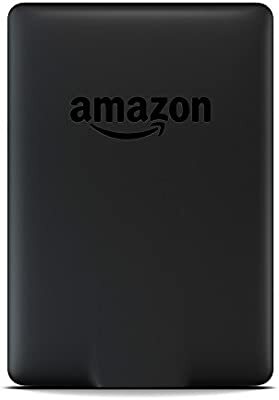 If you got a PaperWhite with 2GB of onboard storage, it still is one of the new versions but it was manufactured before Amazon made the switch to 4GB of storage. Unless you have over 1,000 books, you won't even notice the difference as the 2GB is capable of holding about 1,100 books I believe. Amazon has kept the X-Ray feature so those of you who have the previous generation and are considering upgrading, rest assured, the X-Ray feature is still here and has been upgraded to allow more functionality. More and more books are being preloaded with X-Ray data by Amazon and even it it's not there, you can always use the Wikipedia option to do a search. Those new to the X-Ray technology, it is a capability on the PaperWhite that allows you to click on a character name, for example, and find all references to the character in the book. This is very helpful for novels when a character name comes up that you've seen before but forgot the details about. It's also helpful for non-fiction books when you need to find all references to a particular item or topic. The "highlight" feature allows you to highlight (in black-and-white of course) a particular passage in a book and save it so you can go back to it at a later time. You also have the option of turning on an option that shows you other popular highlights from other readers of the book. This is a VERY useful feature, especially for non-fiction books as 99% of the time, the highlights other users have made, point out very important sentences and paragraphs in the book. Note that this feature does not show EVERY reader's highlights, it only shows the most popular ones and even tells you how many readers have highlighted a particular section. Again, this can be turned on or off if you find it distracting. The dictionary feature works by allowing you to click on a word you don't know or need clarification on which brings it up in the dictionary. Something to keep in mind is the PaperWhite does not come with audio output so unlike the Kindle Fire tablets, listening to audiobooks is not an option on the PaperWhite. If you need audio features, you may want to look at the Kindle Fire lineup as audio capabilities are not available on the PaperWhite, standard Kindle, or the Kindle Voyage. As has been the case for a while now, the Kindles come in either a "with special offers" or "without special offers" version. Personally, I always buy the "with special offers" version because the advertisements, mostly for books, do not bother me as they're really only seen on the screensaver and are not seen when reading the book. Sometimes they actually recommend books that may interest you, but more importantly, I really don't think it's worth spending the extra $20 just to get rid of them. If you think they'll bother you, get the "without special offers" version, or you can upgrade to that version at a later date after purchasing the PaperWhite. This is still my favorite Kindle as it packs the most bang for the buck and is very affordable, especially when Amazon throws it on sale. While I don't think it's worth upgrading from the 1st generation, if you don't have a PaperWhite at all, I'd definitely recommend going with this version. Those with the first generation: I'd really recommend holding off for the moment until more substantial upgrades are made to the PaperWhite, but if you want to upgrade anyway, you certainly won't be disappointed. My son's original Kindle stopped working after two years of use. He's a big reader! He used the Kindle not only or leisure reading, used for his reading assignments in English and Advanced Composition. He would use his Kindle on trips, school and reading at night. So, I had to replace it with a Kindle that offered more. I picked the Kindle Paperwhite because it has a lot of rich features. Below are some of the features my son likes. The Kindle Paperwhite has more features than I listed which are perfect for kids in school. I recommended this device to a lot of PTSA parents that have children that are readers and children that don't like to read. The children that don't like to read realized that the Kindle Paperwhite is a good tool to have. I give the Kindle Paperwhite 5 stars for quality, size, and features. Very disappointed. Gives less, not more than it's predecessor. I bought this Kindle Paperwhite to replace my dead Kindle Keyboard, 2nd gen 3G/Wifi. I hate it. Mostly because, for some reason, it does not allow me to store my multitudes of book titles by Collection, which is the easiest way for me to find what I am in the mood to read. I despise having to flip through every title by the photo of the cover if the book. I can read, so do not need the "icon" option to view book titles. Also, this one has no sound option to listen to my books. Additionally, I do NOT like the fact that all my titles are on the Cloud, where Amazon can decide at any time that I don't have access to them anymore. I suppose they discontinued the very workable, simple Keyboard, and made the Paperwhite so onerous to use, so that everyone will purchase the Fire. I just want a reader that does what I need it to do. I already have an iPad, a laptop, and a desktop. I don't want a Fire, but the Paperwhite does not measure up to the usability of the 3G/Wifi Keyboard. 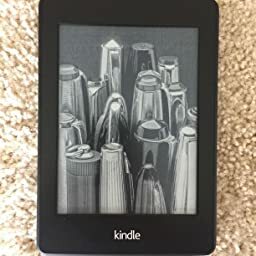 I am an avid book and Kindle reader, but my experience with the Paperwhite has dampened my enthusiasm for Kindle reading. That's something I never thought I would say. 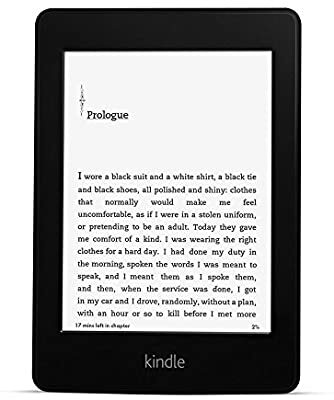 I bought my Kindle Paperwhite to use with my classes. 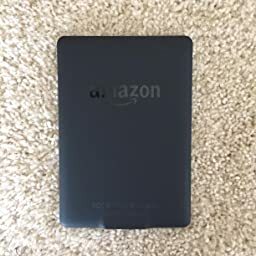 I just became a graduate student, and wanted an e-reader I could use to lessen the number of books I needed to carry (amazon really should make a kindle paperwhite specifically for college kids). I suffered a concussion about half a year ago, and since then I cannot use computers for too long because the light causes an extremely painful migraine. For this reason a traditional tablet that can function as a reader, such as the KindleFire or Ipad, are simply not an option for me. What I really like about this kindle is that even with the backlighting, it really doesn't hurt my head at all. I can sit and read through the assigned pdf files and chapters for a class using this one tool and not get a headache, even if it takes me 3 hours to get through it all. That being said, I was a bit disappointed to realize that some books, specifically some textbooks, are not available on the Kindle Paperwhite. 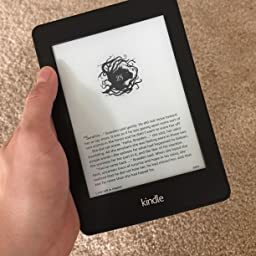 It's frustrating to realize that I can only have access to some ebooks through a medium that is very painful for me (and is also the most expensive e-reader that amazon offers). I do wish that amazon had an e-reader specifically designed and marketed for students, but this is definitely the closest to one that I found. I love having the ability to put my books into "collections", which I do for my classes. I also love that it can read pdf files, but I do wish it could read word documents as well. While you can find free .doc to .pdf converter software for free online, it's software that commonly comes with a trojan attached. More about what I love. I love having the ability to search through a book for a single word or term. I wish you could do this with ebooks before buying so that you are sure it has the content you want, but either way it is a godsend for classes. The highlighting feature is great, and the dictionary feature actually works pretty well. It doesn't work for words in other languages, but I didn't expect it to (tried it with a latin word). The organization is relatively seamless, and it is very easy to go from reading an ebook to buying another, and then coming back to the same page. This might not be relevant for some, but for college students this is nice. You can also set bookmarks, but some books still do not have page numbers attached. This has nothing to do with amazon, but can make citations difficult. The general functioning of the Paperwhite is 100% seamless in my opinion. Within first use I knew how to turn pages, highlight, find definitions, and change the backlighting. I had more difficulty learning how to use my case than I did learning how to use this kindle. So, all in all I really do love my Paperwhite. Some might want to know why I only gave this beauty four stars, so here are my reasons. 1- not all textbooks work with the paperwhite, and this is also true for childrens books and non-amazon documents that are not pdf files. 2- I do wish that there was a multilingual dictionary, especially since this kindle is supposedly able to translate into other languages instantly via bing (for the record, bing is not a perfect translator. Students, do not use it for your language classes. Its grammar is nowhere near perfect). 3- I wish there was a way to change the "size" of the collections on the home screen so that I could fit more on the first page. This would allow me to have all of my classes displayed on the homepage, which would just be nice. 4- Not amazons fault in anyway, but most of the books I have downloaded do not have the literal page number, and make it difficult to accurately cite in APA format for my classes. In spite of this, it is a wonderful machine, and I'm glad I bought it. I'm sure when a new version comes out I will be sad I didn't wait, but I honestly am very happy with my purchase. BUYER BEWARE -- or pay with Amex, or get the two-year warranty. I am so sad to write this poor review, because while my Paperwhite worked, I loved it. However, it suddenly died on me recently -- just after the one-year warranty expired on 11/30/14. It won't charge; it won't reset; the screen is frozen on the low battery screen even though I had kept it charged. I've tried every solution I could find online. I contacted customer service; they had no additional suggestions except to sell me another Paperwhite at a discount. I might even have done that, except that in my online search for solutions, I found that many, many other Paperwhite buyers had identical issues -- some of them were lucky that the problem surfaced during the warranty period but many others, like me, were stuck. I should say that I am very gentle and careful with my electronics; never dropped the Paperwhite or did anything else to it; always kept it in a cover; etc. My old keyboard Kindle still works after several years. I really wanted and enjoyed the better visibility of the Paperwhite, and my husband bought me the top model for almost $200 -- no ads, WiFi plus 3G. I've been a loyal Amazon customer since the company started, and I was an enthusiastic early adopter of Kindle. But I'm deeply disappointed that Amazon seems to have sold a lot of lemon Paperwhites in the last two years and isn't replacing them. I feel burned, and I'm reluctant to take a chance on another Paperwhite or the new Voyage. I went to Barnes & Noble yesterday to look at Nooks. Seriously considering getting a Nook Glowlight to see if I have better luck with that. I'm going to download the free Nook reading app on my iPad Air first and see what I think. Here are some lessons learned; I hope they may help others. I wondered if replacing the battery might solve my problem, as you can buy a kit online to do that for $34.95. Took my Kindle Paperwhite to a Geek Squad desk in Best Buy to ask. Nice guy there hooked it up to his cables and said there was absolutely no response or sign that it was connected, which to him said that the problem isn't the battery, it's probably the charging port itself. They don't repair those (although Best Buy does sell Kindles, including Paperwhites), but he recommended I visit a local smartphone repair shop to see if they could do anything. Another nice guy at the repair shop agreed with the Geek Squad that the battery isn't the issue. He looked at the charging port with a bright light, didn't see anything obviously wrong with it. He confirmed that it would be a waste of my time and money for me to try to replace the battery. He also said that the port for the Paperwhite is soldered to the back and the cost to remove it, then solder a new one, would be high and it's not a "guaranteed fix." I told him how reluctant I was to throw more money at Amazon to buy another one and he looked up Paperwhites on ebay for me! Found several good options there, if I decide I still want another dedicated e-reader. Still thinking about buying a Nook, though. My husband had paid for the Paperwhite with his American Express card. Amex extends the manufacturer's warranty on products you purchase with that card by one year, if the original warranty was five years or less. We got a full refund from Amex. Thank you, American Express! I will not be buying another Kindle anytime soon. But if I do, I will get the cheapest model, in a Lightning Deal or Deal of the Day, and I will pay for it with an Amex card.